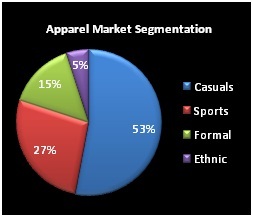 Apparel Retail Industry Going Online | Business Article | MBA Skool-Study.Learn.Share. 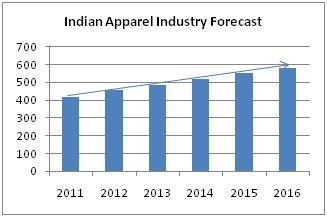 Indian apparel Industry grew by 10.4% in 2011 to reach Rs 419bn. It is expected to reach a value of Rs 580bn in 2016, increase of 38.4% since 2011. Also the men’s share is approximated to decrease to 37%  from 43% , while women’s share to increase to 43%  from 38% . According to Avendus Capital Report, domestic online retail will lead the e-commerce surge with $12 billion potential in 2015. The number of active online shoppers is projected to reach 38 million from nine million now. Indiatimes.com witnesses around 30 to 40 transactions every day, with each transaction being at least Rs 1,500. Also, shoppersstop.com portal’s traffic is increasing by 100% every month. E-tailing is preferred because of rise in awareness & purchasing power of the middle class due to the service industry boom. Online-portals provides a product variety 24x7, option to purchase product in 5-10mins [if the customer is preregistered], provides discounts higher than stores, delivers in 1-5days [depending on the distribution centers], provides cash on delivery or genuine/safe online transactions and product exchange and product customization [like inkfruit.com] options, with friendly customer care team. It allows people to do pre-product research providing virtual environments for customers to visualize if the apparel will actually suit him/her or not. Also there are cases where research is done online but the purchase is done offline, thus the social media influences decisions of these products too. Also as increasing fuel prices keep shoppers from driving to malls, customers prefer going for online offers. It allows experimentation of brands in newer geographic regions with no physical-store presence, providing nationwide reach, thus, an ability to generate interest in the company before making a commitment to capital investment in physical-stores there. E-commerce is a hyper-competitive consumer facing business, thus, venture capitalists want teams with a combination of technology, physical retail-store and internet expertise in their fresh investments. E.g. Zovi.com, a new online apparel brand which manufactures its own high-end apparels, hired 2 senior officials from Benetton recently. Some websites host flash sales for a limited time period. E.g. fashionandyou.com conducted a flash sale of flat 80% for 1hr at 10am on 24July2012. However, physical-stores are conducting sales and promotions throughout the year, following western counterparts, to get more customers and grab market share from competition. Luxury brands like Giorgio Armani, Burberry have associated with online-portals, offering their apparels at discounted prices on portals, as reducing prices may not increase their sales but may increase the user imagery of the brand and brand recognition. Thus, exploring new customers and gaining profits. Also Van Heusen has taken an initiative of Van Heusen’s Coffee Mornings where a team of 20 online community members interact with the company’s designing team on weekends, according to the 2011 FICCI-KPMG Report. The apparels are sold at a lower cost on e-portals than the physical-stores. The margin between manufacturing and sales to retailers is 50-70%, while margin between retailers and point-of-sale to customer is 30-40%. Thus, the online products can be sold directly by the company online-portal at 70% discount but not generally preferred by brands as that will dilute their brand value. Also the market share of saree and ethnic wear in women’s apparel market is ~70%. So, a unique trend of fusion of western and Indian patterns [i.e. casual wear] is on high demand, as the current generation prefers comfort and quality in an Indianized manner. Thus, a lot of brands have introduced apparels like Kurtis, etc. Also, the plus-size fashion is gaining importance with the rising number of obese/overweight Indians [8% population, 96million]. It is found that rural consumers are also shifting from dhoti to more western garments like trousers and jeans. Also, there is an opportunity to offer variety of clothes to obese/overweight that prefer wearing ready to stitch clothes as not many brands offer clothes of their size. Thus, there is a need for the companies to understand the difference in customer profiles and purchasing patterns [buying behavior/shopping experience/demographics/shopping orientation] of the buyers from data collected through online portals using web-analytics tools. Thus, helping to create specific campaigns targeted to specific segments. Data can also be used to personalize user interfaces and to provide them with product recommendations as per their preferences. It allows increasing customer loyalty as buyers prefer to shop using interfaces that they are experienced with. It is an inverse scenario, as now people are talking about product categories and services online, and now the retailers need to frame the questions from them and derive a sample size from unstructured conversations of communities talking on similar subjects. Thus, online-customer experience need to be improved [like viewing product shots from various angles with zoom to provide fabric-like feel], increase customer engagement by social media strategy, blogs, twitter which provide a good insight and expert opinion which helps the user to make the correct buying decision. [34% of bloggers post opinions about products used & brands and 78% of consumers trust peer recommendations] Thus, the highest influencer in decision making is user reviews at 35%, followed by social media networks like FB, Twitter and Youtube at a combined total of 40%, implying that the word on mouth on social media has a great say. There is need of standardization of sizes in India as different companies define small, medium and large differently. As of now, generous return policies should do, but for long term growth this issue should be tackled with. Although physical-stores have few advantages like bargaining in unorganized retail or touch and feel factor, but with rising trend of going digital, brands need to have presence on both digital and physical platforms. 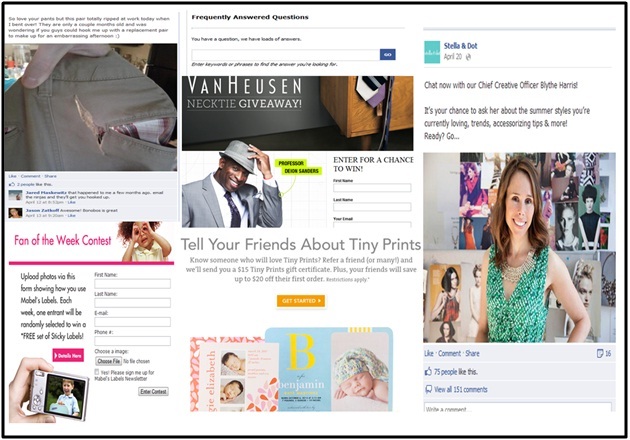 A fun, enticing and easy-to-shop web site can generate interest in physical-stores, and vice versa. This article has been authored by Gagandeep Kaur from IIFT Delhi. Is E-Commerce Augmenting only to Perish?